No, wait, come back! I didn’t mean it that way! I’m a big fan of LOST. I wish I knew more people locally who were really into it so we could have LOST-themed parties with fish biscuits and Dharma Merlot and mangoes (I do sometimes eat tropical fruit while watching). I once tried to invent a LOST drink, which turned out not so great but had a cool enough detail in it that I want to try again. Unfortunately, it’s just us here, so I decided to make something totally super awesome in honor of the (stupid crazy) season finale. Pavlova was something I made a week or two ago and, while it was really yummy, I wasn’t able to get a decent picture of the completed dessert. So, I had to make it again. And soon, because holy crap, Australia & New Zealand, how DARE you not share this pile of sugary wonderment with the rest of the world? I want to tunnel in there and eat my way out. I’m not actually mad at you, Australia & New Zealand. I’m disappointed in the rest of the world for not picking up on this more. 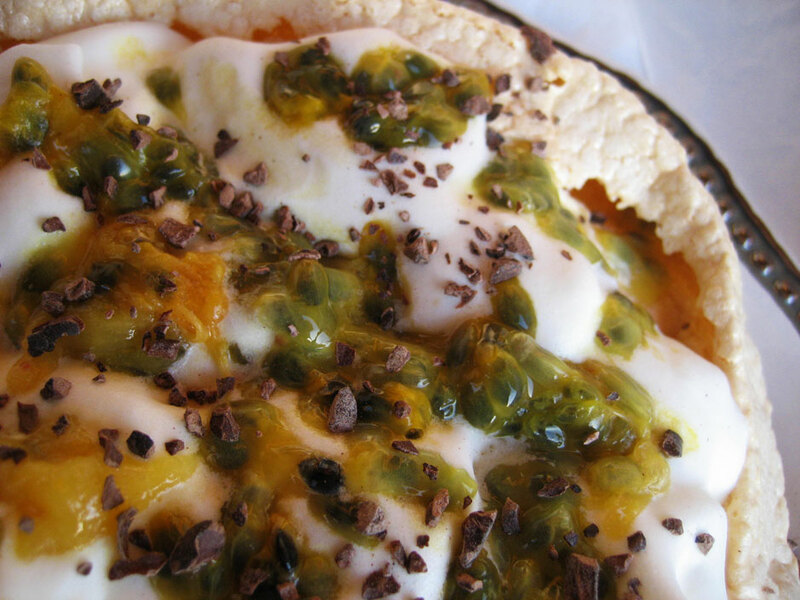 The first time I made pavlova, I made two smaller ones, and topped one with passion fruit and cacao nibs and the other with kiwi and honey. 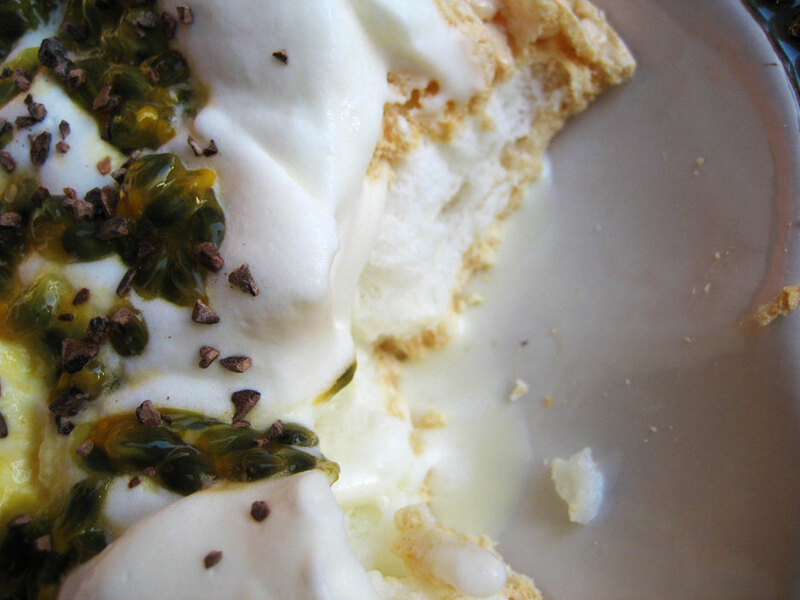 The passion fruit-cacao nib combination was by far the better choice – the crunchy nibs and poppy little passion fruit seeds are a fun surprise among the crispy-yet-pillowy meringue and the soft whipped cream. 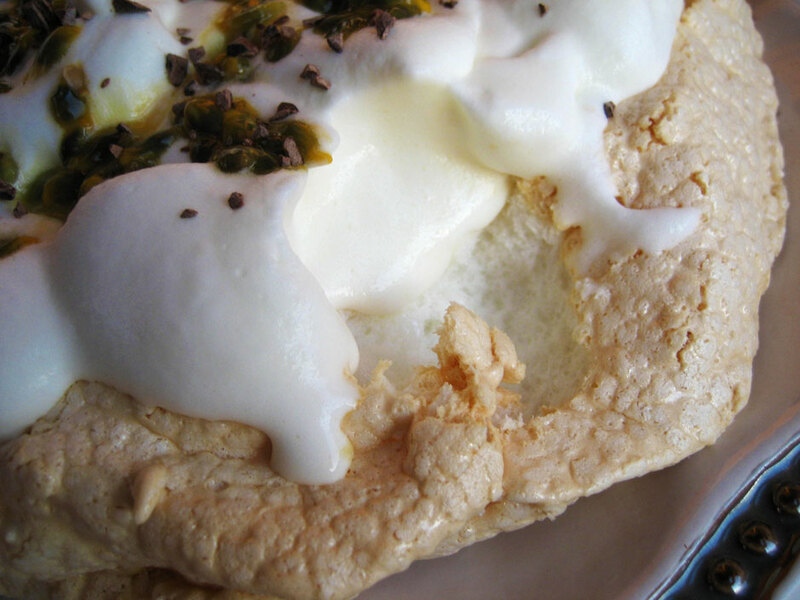 Pavlova was also my first experience using cacao nibs and I love how the normally bitter little nibs become intense little bites of chocolate when eaten with the sugary meringue. Precious, tasty little passion fruits. See, the pavlova makes sense as a LOST tribute because Oceanic Flight 815 departed from Sydney. And, uh, I guess maybe they could find passion fruits on the island? Or, like, the passion of the irritating love triangles and stuff? Or it’s just a super awesome dessert that you can eat while watching a super awesome show. Preheat the oven to 250. In a stand mixer or with a handheld electric mixer, whip the egg whites to soft peaks. With the mixer running, gradually pour in the fine sugar and continue beating for another minute or so, until the meringue is glossy and fluffy. Pour the meringue onto a baking sheet lined with parchment or a Silpat and shape into a squat volcano, smoothing the sides. Bake for 1 hour, then turn off the oven, prop the door open slightly and let the meringue rest for 2 hours. When you are ready to serve the pavlova, whip the cream with the vanilla sugar to soft peaks, then dollop onto the meringue. Halve the passion fruits and scoop their insides out onto the cream. Sprinkle with cacao nibs and enjoy! This is our new favorite dessert. Once the local berries are better I’ll be making some berry pavlovas for sure, and will have to experiment with using different types of sugar in the meringue, or just flavoring it (chocolate meringue with the berries, perhaps). Finally, you may hve noticed that I did not post yesterday. Yeah, I’m giving up on NaBloPoMo. It just didn’t seem to be worth it and I’d rather not spend the whole day stressing about getting something done for the blog. I will continue to post more often than I used to (so there will still be more than one post a week, hooray!) but every day is a bit much for someone who almost exclusively posts about homemade desserts. Now thats the best thing I have seen all day. Wonderful dessert. I’d like to invite you to participate in Dim Sum Sunday. Click on my name to check it out. I used to watch Lost during the first season when it was on at 8:00. Then, they moved it to 9:00 and then 10:00, and I just couldn’t take it. Sigh. yes, every day can be a bit of a chore when you actually have to eat all those desserts! it seems great, until you can’t open the freezer without a cookie avalanche. i JUST finished off the last of my frozen christmas cookies yesterday afternoon. i had to declare a baking hiatus when i discovered that. but this makes me want to get right back in the kitchen! i love pavlova. 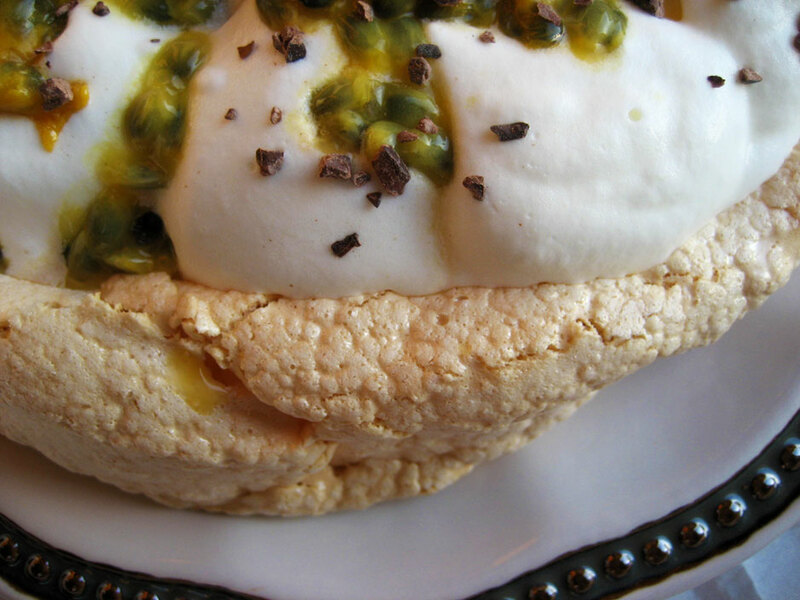 Oh, I love pavlovas – they are the most delicate dessert and taste fabulous, too! This looks like an amazing dessert. 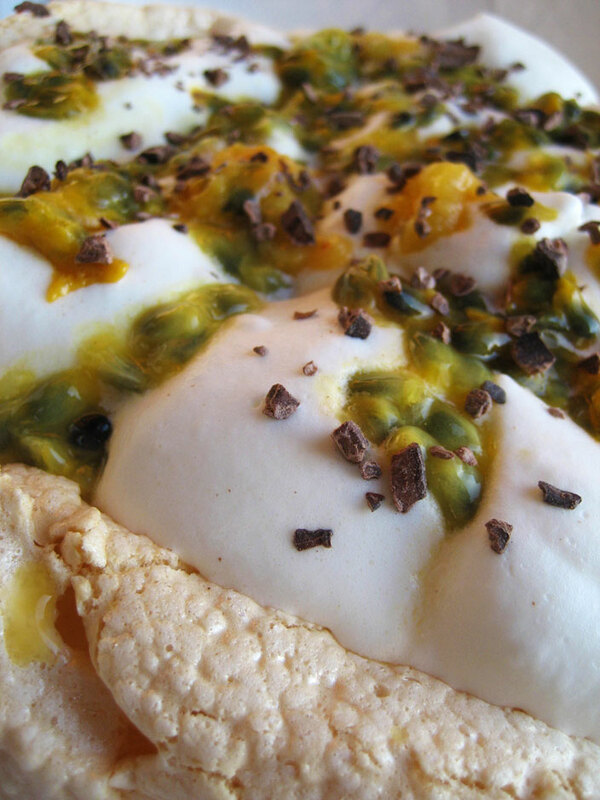 I love passion fruit AND pavlova so the combination sounds perfect to me. Beautiful job! This looks incredible. Absolutely delicious. Never was into Lost much, Im a Greys Anatomy, 24 typre of girl. First time here, love your blog.